To provide safe anesthetic care for your child. 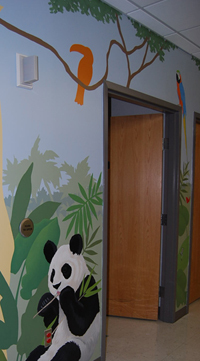 To lessen the anxiety that may come with your child’s trip to the operating room. To provide, when needed, an effective plan for pain control after surgery. It is understandable that planning for a child’s surgery is stressful for parents. To help prepare you and your child for the hospital experience, it is important to speak honestly with your child before the day of surgery. Be aware that your feelings of anxiety, although normal, can be sensed by your child. Try to be positive and provide the emotional support your child needs. Why do I have to have an operation? Will I be awake? or, Will I wake back up? How long do I have to stay there? Two to five year old children worry mostly about being separated from their parents. Young school age children will also have fear of pain. Older children will want to know what will happen to their bodies. Answer these questions as simply and as honestly as you can. If pain is expected and is a concern for your child, it is truthful to say that the pain can be treated with medicine. The medicine will not hurt and they should only feel a little sore afterwards. Click here for a family friendly video to help you and your child understand what one patient’s experience was at the North Carolina Children’s Hospital. Haga clic aquí para ver un video accesible para toda la familia, que le ayudará a usted y a su niño a entender la experiencia que tuvo un paciente en el North Carolina Children’s Hospital. Parents often have concerns and questions about their child’s anesthesia. 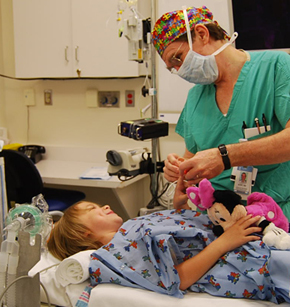 We provide a team of specialty-trained pediatric anesthesiologists to care for your child. You and your child will talk to an anesthesiologist before surgery. This may be on the day of your pre-op clinic visit or on the day of surgery. The anesthesiologist, along with your child’s surgeon, will plan for the management of pain after surgery. Your child will be cared for by the anesthesiologist from the time before entering the operating room until acceptable recovery from anesthesia medicine after surgery. When the anesthesiologist is certain your child is comfortable, your child will be ready to return home or to be taken to a hospital room. Your child must follow some rules about eating and drinking on the day of surgery. Specific instructions will be provided to you during your child’s preoperative evaluation. It is very important that your child follows these rules. This is for your child’s own safety while under anesthesia. 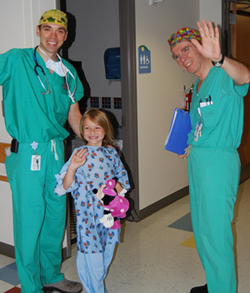 Sometimes it may be helpful for you to accompany your child into the operating room. For children over 1 year of age, one parent or guardian may be allowed to go with their child to the operating room for the start of anesthesia. There are times when this may be less safe, or may not be possible. The anesthesiologist will make the final decision on this. If needed, we can help your child relax before surgery with medication that is taken by mouth just before entering the operating room. Please bring your child’s special toy or blanket. Having this special thing from home will help bring comfort before and after anesthesia. There are a few different ways for children to go off to sleep with anesthesia. One way is to breathe from a clear space mask hooked to a blue balloon. Sleep comes rapidly to the child. If an IV (in the vein) line is already in place, the anesthetic can be started using this. We try to avoid needle sticks while the child is awake. Some children will still prefer a needle stick to a mask. This may be true for children who are 8 years old and older, or children old enough to know they did not like a mask experience from a previous surgery. Talk to the anesthesiologist about these different options. During surgery, anesthesia will be continued (maintained) using inhaled (gas) agents and IV medications. Some children may benefit from the injection of local anesthetics (numbing medicine) as well. Although most children need general anesthesia because they are unable to cooperate, your anesthesiologist may also talk to you about providing some form of regional anesthesia (epidural, caudal, spinal or peripheral nerve block) as a supplement to the general anesthesia or as a method to control postoperative pain. The decision for which care is best depends on the health of your child and the type of surgery. After surgery, your child will stay in the Post Anesthesia Care Unit (PACU) until alert and comfortable. When the nurse caring for your child has your child settled and comfortable, you may be allowed to visit (usually no more than 1 person at a time). There are, however, times when the PACU is crowded or very busy and your visit may be delayed or impossible. The most common concerns in the post-anesthesia time are good pain control, normal breathing patterns, and control of nausea and vomiting. If your child had a breathing tube during anesthesia, you may notice some hoarseness or complaint of a sore throat. This should go away after one day. If your child has had certain forms of regional anesthesia provided for postoperative pain control or if pain control is expected to be complex, then your child may be seen on a daily basis by our Pediatric Pain Service while they are in the hospital. The healthy child is an excellent anesthetic risk similar to the risk of any healthy adult. If your child has any health problems that make the risk greater, the pediatric anesthesiologist will talk to you about them and answer any questions that you may have. If your child comes down with a cold or symptoms of illness during the week before the planned surgery, please call your surgeon’s office. Your child may need to be seen or the surgery moved to another date when your child is well. Major surgery may involve the need for blood products. The UNC Hospitals Blood Bank uses the newest and best available laboratory tests to check collected blood for infectious risks. We use blood products cautiously. If you have specific concerns regarding the use of blood products, please discuss these with your anesthesiologist and surgeon before surgery. For more information, you can call your surgeon’s office or the Department of Anesthesiology at UNC Hospitals to speak with a pediatric anesthesiologist at (919) 966-5136. Also you can find additional information from the following links.